Although we’ve been around for quite some time, chances are you haven’t heard of the Delivery Operations (Del Ops) team at GDS. And if you have, you probably don’t have a clear idea of what we do. We thought it was time for an introduction. In Delivery Operations, we work behind the scenes at GDS to make sure it can explain what it’s doing with the resources it has been given. We help GDS make decisions about how to use its resources for the greatest impact. And, we check why GDS is doing things, how well it’s doing them, and how much it’s spending. GDS needs to show that it’s making the most of any money it receives. The Delivery Operations team are the people who make sure it stays accountable, and make it as easy as possible for teams in GDS to do good work. Individual teams inside GDS do a terrific job sharing what they’re doing and showing their own roadmaps. But, we also need to have an overview of everything happening at GDS. Delivery Operations helps teams to explain their goals, to tell us what they need to reach those goals, and what they think might get in their way. We provide tools to make it easy to tell us what people and other things will be needed, when, and for how long. Sometimes we need to know when things will be ready for other departments to use. At other times, GDS may need to answer a question from someone outside of government. Or, within government, it may need to ask for money, or explain something to other departments. That’s where Delivery Operations steps in. We take data about finance, people, and goals within GDS and turn it into information which can be used by everyone in the organisation. It’s impossible to know everything that will happen when you start a project. But it’s important to try to predict as much as you can, and make sure you are able to respond quickly as things change. We need to have the most up to date information we can to be sure we are making the best possible decisions. Change happens all the time at GDS, with everything from priorities and resources, to the things that people want and need. Delivery Operations works to minimise the impact of these changes as much as possible. We let people know about the impact of any changes as early as we can, and if any decisions need to be made. One example of this is our work on the Single Departmental Plan, which states what Cabinet Office will do between 2015 and 2020. We produce monthly reports on how well we're doing at meeting the goals on this plan, and any issues that may have come up. Sometimes, it makes sense to stop working on something that started out as a priority project. We help teams to identify if a project is no longer the best use of resources. We tell them how to explain the reasoning behind their decisions, and the impact any changes they make will have. Traditional models of management may have worked well in the pre-internet age. But, they can’t keep up with the pace of change in our digital world. For this reason, GDS has long championed agile ways of working. We move projects along in small continuous steps, and make changes along the way. It’s a slow and steady process, and it’s easy for us to go back and fix things if we find any problems. 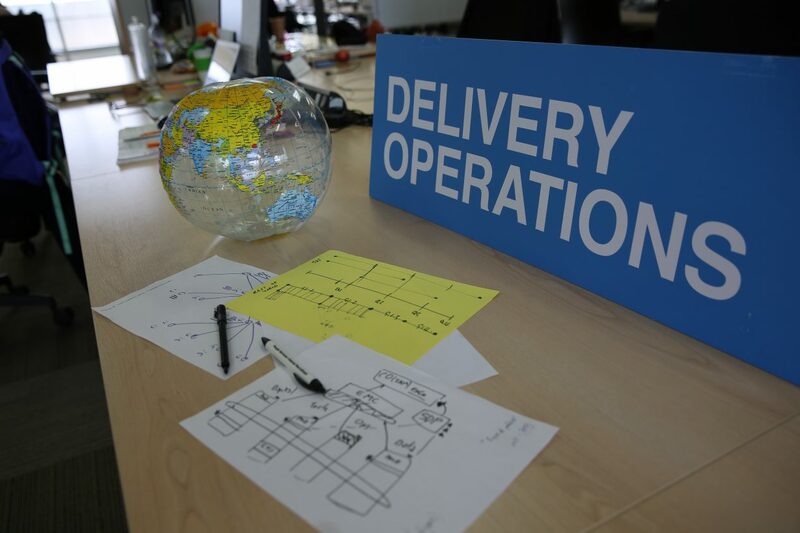 Delivery Operations has introduced agile thinking to help manage every aspect of our business. We use it for everything from planning our work, to reporting on what we’ve done. And, we frequently check how much GDS has spent on projects. We ask ourselves questions like; are we dealing well with risks and issues as they come up? Are our tools as flexible as they need to be? We want to make sure we invest as much of our resources as we can into actually "making the thing". We also regularly check with the people we support at GDS to make sure we're doing the best job we can. We carry out frequent tests to get to know our own internal users and their needs. The things we learn help us to develop better ways of managing information and resources. We’ve made several changes to make sure the Delivery Operations team is working in a truly agile way. To start with, we’ve stopped using large systems that were hard to adapt to our requirements. In their place, we’re using lightweight cloud-based tools (some that we’ve built ourselves) that can change as our needs do. These tools make it simpler and faster for teams to tell us about their needs, and when they need them met by. They also allow them to tell us how they’re doing, and when and where they need our help. We like to do small things more often. Rather than holding long yearly planning meetings, we now meet for just a few minutes every week and slightly longer each month. We’ve also introduced quarterly goal-setting (using Objectives and Key Results). Every three months we set new goals for the next quarter, and review how well we’ve met our goals for the current period. Our goals must be easy to measure, so that we can easily see how we’re doing and decide if we need to do different things to reach our longer-term targets. We've made it easier for teams to see how they’re doing and to catch problems sooner, before they get big. It used to take months for teams to find out if their plans for when, where, and how they would spend money were correct. Now, they can update us and find out in a few hours, and they can do it every month. We did this by looking carefully at how teams were making their estimates. Using this information, we were able to try out new methods, and build new tools to help them. Recruitment is another area Delivery Operations has been working to improve. We’ve linked our business planning tools with our recruitment plan. And, we’ve built simple dashboards for different communities within GDS. These help us understand how demand will change based on our latest business forecasts. They also make it easier to see if it would be beneficial to move people between teams; both to help us meet our goals, and to further people’s careers at GDS. In the next few weeks we’ll be sharing more about what we’ll be doing in the 2016/17 financial year. It won’t be a traditional “annual business plan”. We'll look at some of the important things that people have asked GDS to do. We’ll be discussing the things that we think are most important to do now and, finally, estimating how much we plan to spend. We’d like to hear from you too. How do you keep track of where money is being spent, and on what, in your organisation? What do you do to make it as simple as possible to share what’s happening, highlight issues, and make decisions about what to do next? What else would you like to learn about Delivery Operations? In future posts we’ll go into more detail on how we operate. Things like the specifics of our tools, how we set goals, and the challenges we’re facing. But for now, please join the conversation below! I'd like to know which tools and technologies you've stopped using with a bullet-point heading for the reason, maybe even the replacement like for example. It'd be very open and very interesting, and might yield some outside feedback, or pointers on emerging technologies. Hi James! Thanks for your interest (and your comment). We'll be publishing another post soon with more specifics. The main thing has been moving the business planning process from a cumbersome annual event to something much lighter and more real-time. A big part of enabling that has been the tools we use to collect, store, and share information. They're simpler than you might think and easy for us to change so they can evolve as we do. So keep an eye out for our next post. And thanks again!